While colic in horses is often unavoidable, many colics with unknown causes may be related to poor digestive health, and thus could have been prevented. Scientific research and experience both correlate several common management practices to poor gut health as well as increased colic risk. Making digestive health a priority is important for all horses, not just those who are already clearly experiencing problems. Here are some steps you can take to start promoting better gut health and reduce the risk for colic in your horses. Horses should be turned out on quality pasture (or with hay) for as many hours of the day as is possible. Around the clock is best, as long as they have access to shelter. Of course, don’t keep them out in severe weather or extreme temperatures which could be dangerous. Find healthier ways to get your horse the extra calories he needs for work, such as feeding soaked beet pulp,. Also, recognize that promoting a healthy gut will enable your horse to better absorb nutrients in his feed – reducing the amount of extra calories he needs. Most horses are fed grain dumps and several flakes of hay 2 times a day. Instead, break meals into more small meals throughout the day. Just like it’s better for us to eat small amounts throughout the day, it’s even more important for horses to be able to graze on their food. Provide constant access to forage. Horses should receive 1.5-2% of their body weight in forage daily, and also need it trickling through their systems constantly for optimal digestive health, function, and nutrition. 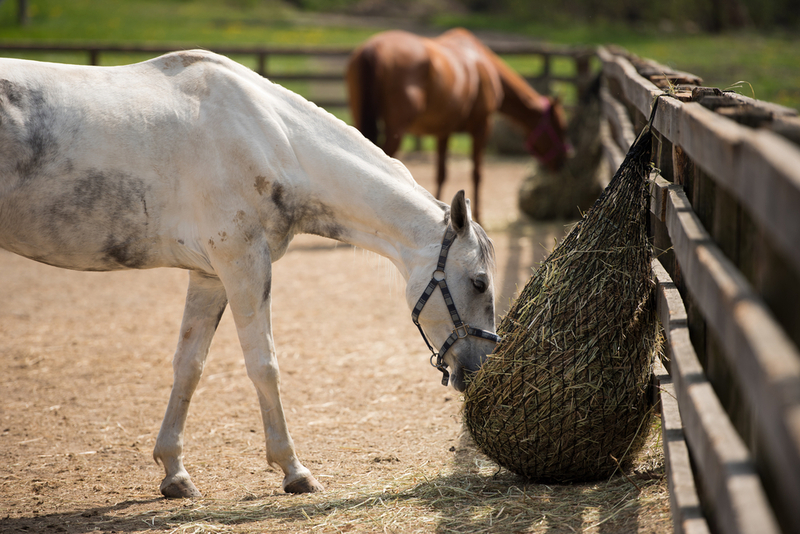 Encouraging horses to eat more slowly allows hard feeds more time to digest properly in the foregut and intestines. Mix chopped hay in with your horse’s grain to slow feeding time, use haynets, put a few large rocks in the grain bucket so your horse has to pick around them. Switch between new types of feed – grains AND hay or pasture – slowly over a period of weeks. If you are moving to a new barn, take grain and hay from the old barn to help give your horse’s hindgut time to adjust. Gradually increase the ratio of new to old feed throughout this time. As they say, “an ounce of prevention is worth a pound of cure.” Any time and money you spend to ensure your horse’s wellness may be money saved in emergency visits, travel and treatment at a clinic, or a risky and expensive surgery in the event of a colic. We recognize that many boarding or home-care situations may have necessary limitations that do not allow for implementation of all of the natural care recommendations discussed above. In these cases, it’s important to take steps to fill in the gaps another way. Work with your veterinarian to select a feed supplement that is scientifically researched, tested, and licensed for sale and is well recommended by those who use it. A good supplement will contain ingredients targeted to the healthy structure and function of the entire equine digestive tract (not just gastric or hindgut) to promote total gut health. Also keep in mind that any product that has gone through the appropriate channels to get licensed for sale in each US state may not be able to provide their research directly to you due to regulatory issues. Be sure to involve your veterinarian, who will be able to access that kind of information. Talk to your veterinarian. Your barn manager. Your trainer. An equine nutritionist. Develop a specialized plan to fit your horse’s unique needs and take all the steps you can to promote digestive health and prevent most colics.